In lovely condition. 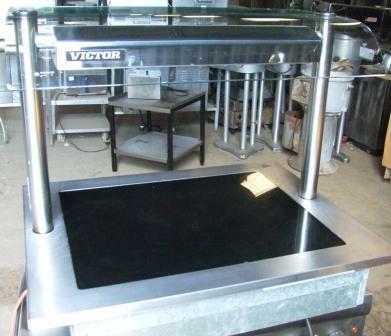 This heated servery from Victor, is ideal for a counter top or bar service and could be great for hot dishes such as Lasagne, stews and roast joints. It could be used as a table top unit also. With a glazed ceramic heated surface and heated oveerhead gantry. It offers smart looks, a curved glazed sneeze screen and Victors famous build quality.